Not knowing who to trust leads to wars. and not knowing who to admire is what leads to genocides. If you trust the person who is getting revenge, that person is playing to your fears and drawing you into conflict, and the test is whether the plan treats everyone fairly and equally. Equality is the principle that people who have been dragged into a war lack. If you admire the person who is getting revenge, that person is playing to your fears and drawing you into conflict, and the test is whether the plan takes away anyone's rights. Liberty is the principle that people who have been dragged into a genocide lack. The Universe has three levels, and so does every part of it, including the U.S. legal system. They are: Principles, Power and Project. The U.S. legal system has Universal Law, Constitutional Law, and Federal and State and local laws. Our Creator says in the Bible, "Vengeance is Mine, saith the Lord." That is because it does not stand on the principles of Universal Law. It is not based on principles, but on fears. Constitutional Law that was written that does not stand on the principles of Universal Law leads to chaos and conflict, and projects--acts--based on revenge lead to wars and genocides. There are five other power games that are played, and each come from a sense of fear and a sense of lack. The final power game is based on acts of terrorism, and what comes next is a failed state, which lacks everything. No equality. No liberty. No freedom. No compassion. No abundance. No capacity. No tolerance. Our organization is working to end the Iraq War which devolved as a genocide. Tomorrow, we will start to look at how the United States can avoid becoming a failed state. Each of our government proposals has an associated set of books that explain the principles, the application of the principles and the three planning steps. The books associated with the Exit Strategy for Iraq explain the principles of power, and where true power comes from. The first booklet addresses the first principle, and that is how revenge works and why it doesn't work. 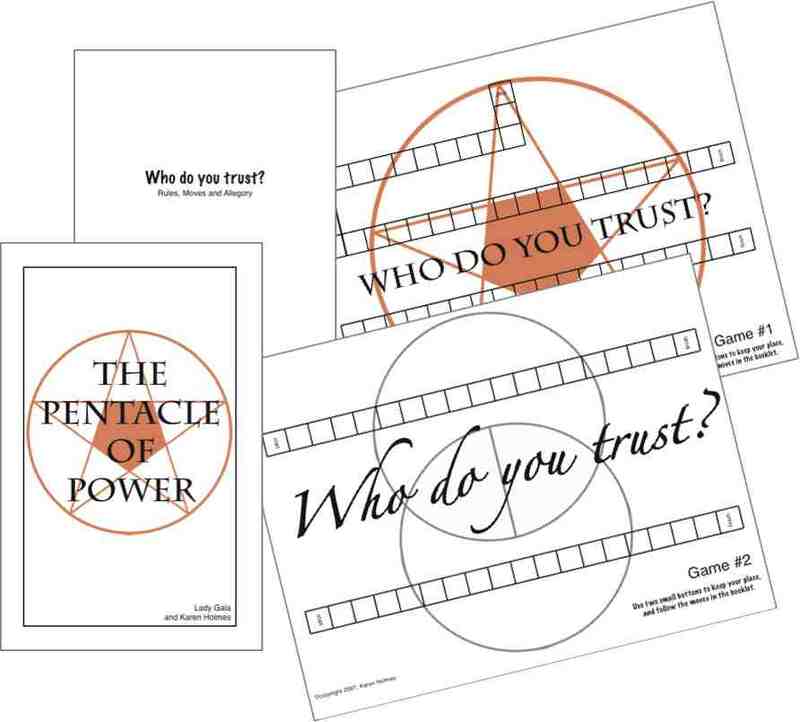 "The Pentacle of Power," by Seth and me, includes a simple board game, called Who Do You Trust? This board game is a actually two separate boards that demonstrate the subtlety of the power games related to revenge. The game of revenge demonstrates how one person targets another to stop him in his progress. The second demonstrates how win-win agreements function to allow both people to function on a far higher level. These games are played for high stakes, so it benefits everyone to understand how these games function. These blog posts are my watered down versions of what I have learned from these books. The books do a far better job at explaining these principles. If you are interested in going deeper into learning about the principles of each of the proposals, including where mankind went wrong and fell into crisis, I recommend the books. Half the income from the sales of the books goes to support the organization's projects, which benefit everyone. 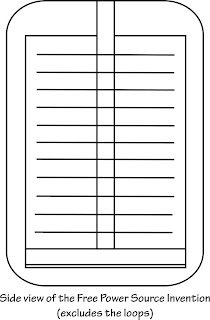 At this time, the books can only be sold to the independent members of the organization. The first people to come in are the professional publishing team, but they are still is stopped in their progress because they didn't know who to trust. 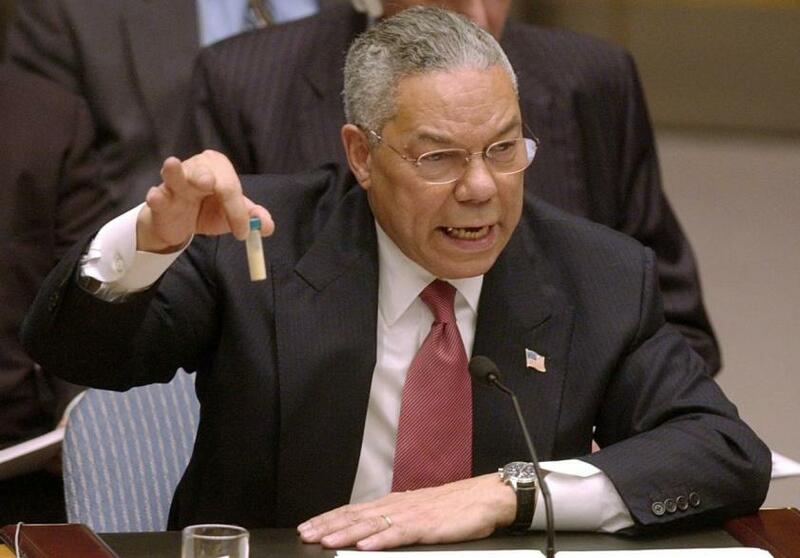 The image of Colin Powell holding up that tiny vial before the United Nations is etched in my mind. It is the responsibility of the Cabinet to be watchdogs of the president, but Colin Powell was confusing his role of general, who must be loyal to his Commander in Chief, with the role of the Secretary of State, who is responsible for being a watchdog of the president. The president is responsible for foreign policy decisions, but not to force a personal agenda. The Cabinet is like the Flower of Life level of our organization. The boss of the project is responsible for teaching the principles, and the Flower of Life level are watchdogs to make sure he or she stands on the principles. Think of a family based on a wealthy husband and a trophy wife. Imagine the husband pegs the family on a particular level in society, and his wife can take the family higher based on principles or lower from that point based on her fears. If he works late at the office, and she fears he is having an affair, she can tear apart the family, and drag in the children and even the neighbors. (This is something our organization will address with our California Community Property Law project.) It is up to the husband to demonstrate the principles, and the wife to be the watchdog to see that he is standing on the principles. Our World Peace Marketing Strategy allows everyone to function on a higher level, based on what is important to them. For the husband, it is the principles, and for the wife, it is her financial support and the support of the people around the family. Their children are the watchdogs for their mother, to make sure she is standing on the principles and not getting revenge, and drawing in the extended family and the neighbors, who are the ultimate watchdogs, because if the family is imploding and drawing in the children, the wise neighbor can defuse the family crisis--even if it is by calling the police. There is a trickle down effect, level by level, with the teachings, and a trickle up effect, with the watchdogs. The American people are responsible for making sure our government stands on the principles. It is the entire planet who are responsible for making sure the plan for the international government stands on the principles. This is where the United Nations has failed. The U.N. Charter has five flaws, and the Bush administration was able to force their agenda to invade Iraq. The voice of the watchdogs was not regarded. The economic basis for the proposed international government is the principles of the cooperation of nature. Nature is seen as dog-eat dog, and the survival of the fittest, and therefore it seems to be a competition for resources, but that is a misunderstanding of how nature functions. Nature creates a sense of abundance for all. There is an element of predator and prey, but that keeps a sense of balance, because if every species continued to multiply without any checks, the planet couldn't survive. It is all part of how the food cycle functions. There are natural cycles in nature, too, with wet years and drought, and our ancestors learned to store foods for the lean years. The weather may seem to be beyond our control, but mankind's fears are energy, and when many people in one area are fearful, they fall into circular thinking-- that they must do something, but they don't know what to do, but they must do something.... The combined energy gathers and runs along the energy lines of the planet, and lodges in energy points, and leads to hurricanes and tornadoes. By evolving to the point where mankind is "walling the straight and narrow"-- by standing on the seven principles of the Light Source Invention-- the weather extremes will moderate, too. Man influences nature. The influences are based on fear, which leads to compensatory power games, which creates a sense of Darkness, and so the Light Source invention is what overcomes the Darkness. It overcomes the fear. There have been diseases that attack particular species, such as Bee Colony Collapse Disorder. It is based on a fungus and a virus that attacks the hive. Viruses are thought-forms that are manifested on the physical level. Fungi generally prefer dark and damp places, and the rise of the incidence of the disease in various locations around the world coincide with local and regional conflict. Much of the global food cycle is dependent on bees for propagation. Mankind's are creating famines. Panama Disease in bananas is also fungi-based, and certain species of bananas are facing extinction while growers rush to find resistant species. Prion diseases can also be directly attributed to conflicts, and affect cows and sheep, and there is a human form, too, and a large percentage of the population of England has been exposed to this horrific disease. There are economic issues that affect famines. Widespread poverty or personal financial crisis cause people to eat or sell their livestock or their seeds that have been set aside for replanting--their resources--and then to rely on the governments for aid, foreign and domestic. 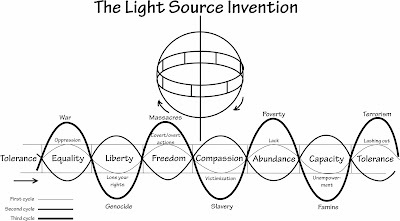 Political power grabs are oppressive to the people, and according to the Light Source Invention, they trigger famines. If a dictator declares himself to be an ally on the War on Terror, he may do so at the expense of his own people, and divert aid to his own pocket. The Light Source Invention demonstrates how acts of intolerance lead to famines--and eventually to a failed state. The solution is the plan for the international government. It creates a sense of balance again in the nation that is facing famine, because the next step in the Light Source Invention is terrorism, and that comes when the people are denied a voice in their government, and must raise their voice to be heard, oftentimes to the point of violence. Any nation that is experiencing acts of terrorism is so far out of balance that the next step is to become a failed state. Prevent the Famine in Somalia! “You give a poor man a fish and you feed him for a day. There is a famine coming in Somalia, and institutions and organizations are rushing to prevent a major humanitarian crisis. The question is, how do you prevent a major humanitarian crisis? How many tons of food does it take to feed 240,000 people? How do you prevent famines? 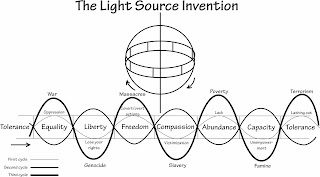 Our Light Source Invention is a demonstration of how famines devolve, and with the root cause, with the planning process we can find the solution. Confucianism teaches the principles of capacity, and the Chinese have already taught us how to prevent famines through their proverbs. It is all a bit more complex than teaching someone how to fish. It is a long process, starting with intolerance and being denied a voice. People who live in poverty lack a sense of abundance, and that leads to famines. People function outside of their capacity, and the anger from having a lack of a voice in their government leads to acts of terrorism. Somalia would benefit from joining in the creation process of the proposed international government. Its economic principles that enable the creation of a global renaissance start with the idea that everyone must function from his or her own capacity. Every aspect of the plan will support the people in creating the life they want without interference. C.S. Lewis wrote the Narnia series as allegory for this time period, and at this time, the potential independent members of our organization are immersed in "The Silver Chair," which is based on the game of Greed, but the game goes beyond just stealing from someone. 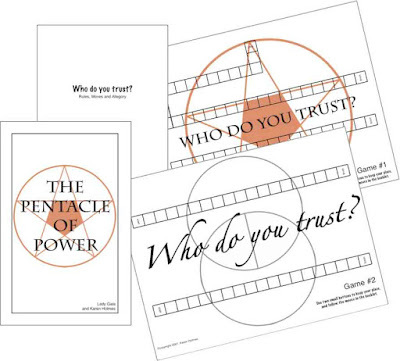 It includes elements of two other power games, and both weave an illusion. One is genocide and the other is slavery. The villain of the story is the Lady of the Green Kirtle. She is doing a hostile takeover of Narnia. She traps the prince in a Silver Chair and weaves a strong illusion around him to keep him trapped. Two children and a Narnian are sent by Aslan, the lion, to free him, and to do that, they must overcome many plots and the main illusion that keeps him trapped. C.S. Lewis said that behind every story is a white witch, and he was referring to a sociopath--someone with a narcissistic personality disorder. Like a poisonous spider, he or she draws others into a web of deceit. 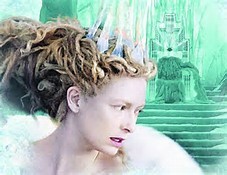 The Ladies of the Green Kirtle are trapped in the White Witch's illusion with a form of mental illness. She is functioning outside of her capacity. She is wielding immense power, but she knows she is a fake, and lies to protect her security. She cannot tolerate the truth. In the Silver Chair, when the heroes battle the Lady, she becomes a huge green snake, and she twists and turns and weaves the illusion. She cannot be backed into a corner. This same crisis is occurring within several nations, including the United States. It is happening within our organization. We are average people who have been thrust into a position of power, and have no problem with accepting power as long as we function from within our own capacity. But those who have grabbed for the power, are stealing the plans, and see this as their grand opportunity to get their life, they know they are fakes and have trapped men with power and work to control them. It is not just the women, there are cases of men who are doing this too. What they hold onto has become a trap. In the future, every person on the planet will function from within his or her own capacity. Each of us will learn what our talents and gifts are, and find a niche, and market it with family to create a family niche, and then market our family niche with our friends. This is how the prosperous families from the past created dynasties. It takes one individual in the family to start the process. In our organization, the process is starting with me. I am a channel and my gift from our Creator is to be able to communicate with anyone "on the other side." I am working to introduce the plan for the international government, and the principles we stand on create a framework of projects. I am introducing fifty innovative project ideas, and offering them to average people who will function from within their own capacity to create the projects. Only enough information has been introduced to open them to debate. As they create their own plans, they draw in investors, who will share in the process. As we become advisers to the governments, we cannot accept any form of bribes or coercion. The way to prevent us from falling into a trap, we must already be getting our life, but it must be based on sharing our own talents and gifts with others. No one can do another's project because it is based on our talents and gifts. In solidarity with the call for a Day Without Immigrants, our organization is posting the text of our email we sent to the attorneys who offered arguments last week in the State of Washington and State of Minnesota v. Trump case in the U.S. Court of Appeals for the Ninth Circuit. The call went out for immigrants to take the day off from work to show what an impact they have on the local economy, and organizations and businesses around the nation are closing in solidarity. "I am the founder and director of a non-profit organization, and our goal is the creation of an international government based on the U.S. Constitution and the cooperation of nature. One of our exempt purposes is to purify the U.S. legal system. I am not an attorney, but I would like to offer insight into the root cause of terrorism, which may clarify to the court why President Trump's immigration policy does not make the United States safer." "The generally accepted root cause of terrorism is was summed up by President George W. Bush when he declared, "Some people are good and some people are bad, and the bad people want to hurt the good people." The root cause of terrorism is that "people on the bottom are denied a voice in matters of grave concern, and must raise their voice to be heard, oftentimes to the point of violence." "Terrorism comes from the power game of Anger, which is one of the Seven Deadly Sins. They are considered deadly because someone always dies when the games are played. Governments play five of the seven games, which lead to wars, genocides, massacres based on the game of Greed, slavery and terrorism. The symbol for revenge is a pentacle--a five-pointed star, and if you remove the points, you have a pentagon. The headquarters of the U.S. military in Washington, DC is shaped as it is because it is the symbol of revenge." "With acts of revenge, five people or groups of people come together with what appears to be a common goal, but the revenge is a means to an end, and they actually do not have a common goal, and ultimately they undermine each other. To draw the five pointed star, the person who plays the game of Pride wages war on the victim, based on the belief that he has the right to put the other down. That brings in the person who plays the game of Envy, which is based on the belief structure that he has the right to judge the victim as being evil. [That leads to genocides, and it draws in the people who play the game of Greed, which leads to massacres, based on the belief that if you can judge someone, you can take what is rightfully theirs.] That brings in the people who believe if they can take what is rightfully someone else's, they can own that person. That brings in the people who believe they can deny the victim a voice, which leads to terrorism. Acts of terrorism are justification to the person who plays the game of Pride. That completes the star." "If you open a dialogue, acts of terrorism fade away. The [person who plays the] power game of Pride undermines those who play the game of Anger." "The U.S. legal system actually has three levels: Universal Law, Constitutional Law, and Federal and State Law." "Universal Law fixes our legal system on a very high level, because it applies to every atom in the Universe, and it addresses our inalienable rights--our founding fathers declared "among these are life, liberty and the pursuit of happiness." They are the right to be able to live our life without interference, to be treated fairly and equally, and to have a voice in our government. The Universal Law of Cause and Effect is something that is taught in kindergarten as the Golden Rule, or "do unto others as you would have them do unto you." Every major religion is based on the application of Universal Law. At this time, every person on the planet has been exposed to Universal Law." "Constitutional Law is the application of Universal Law within the United States, and this is an evolutionary concept that expresses where our nation is along a continuum. We can evolve or devolve based on the choices we make." "Federal and State laws are the application of both Universal and Constitutional Law, but if Federal and State laws do not apply to all people, it creates contradictions in our legal system, and this is what our organization is working to purify. Contradictory laws create chaos in our legal system. If Federal and State law does not address Universal Law, there is a backlash." "Our Constitution guarantees to every American citizen our inalienable rights, which are granted to every person on the planet by our Creator. By denying inalienable rights to others who are not citizens of the United States, our actions go against Universal Law, and rather than to gain power, we lose power. If foreign policy is based on power games, it leads to acts of aggression, including war, genocide, massacres, slavery and human rights violations, and terrorism." "An example of this is the preemptive strike on Iraq, which went against the premise of our legal system that someone is presumed innocent until proven guilty. That premise has been included as part of our legal system because you cannot defend yourself from prejudice and ulterior motives, and because our Constitution guarantees to every American our inalienable rights, it is up to the federal government to defend our citizens in court--which is where disputes are resolved-- and because our legal system is based on the application of Universal Law, by extension, we must enable every other person on the planet their inalienable rights, or face the backlash by losing our rights. By denying the Iraqi people their inalienable rights under Universal Law, we are losing our rights in the form of increased acts of terrorism and the rise of "violent extremism." Muslims are rising in protest because our foreign policy does not stand on the principles of Universal Law." "Our goal is the creation of an international government that will guarantee to every person on the planet their inalienable rights, and as of today, people in 85 nations, including Muslim nations, support the plan for the international government. A list of people who support the plan is on our website, and it includes prominent Muslim leaders, including the past king of Qatar--now deceased." "I hope this gives you insight into this case, and allows the highest good for all people to come from it." One of the rights a citizen of the international government will is to leave their nation if he or she believes he has been oppressed, and because the power a nation has is based on population, that nation will lose power in the international government's House of Representatives, which will decide whether it is the will of the people for bills to become law. The Faith of the Pure Ray is based on the fact that each of the world's seven major religions teaches one segment of the body of knowledge necessary to create the life an individual wants, and so this faith unifies the world's religions. Faith of the Pure Ray churches will be more like schools that teach people how to create their life, and in the same buildings will be offices of the international government that will guarantee the rights of the people to leave. If an individual who is being oppressed goes to the church/school to apply to leave, while waiting for the international government to find a more suitable home, he or she can take classes to learn how to create his or her life, and therefore it will be easier for the immigrant to find a new home. As the principles of the global renaissance become mainstream practices, the economies of the world will rise, and as disputes between nations are settled in court rather than the battlefield, and as governments let go of their oppressive power games and start to support their people rather than to oppress them, fewer people will find the need to leave their country. Because the existing borders in many cases were drawn as the result of wars rather than around cultures, as peaces comes, the borders may be redrawn or cultures will spin off to create new countries, and there eventually, there may be up to 500 smaller nations. Immigrants in the future may stay in their homes but work together as a culture to create a new nation with equal status in the international government. What can Yemen teach us about power? Yesterday, my post covered Iran and the Free Power Source invention. It was the first project idea that spun off from the plan for the international government, and it started the technology segment. That invention idea creates a win-win agreement within our organization on the Flower of Life level. The family of the independent member who is parallel to Iran is facing the same crisis Iran is facing, and the invention offers the solution to their crisis. As mentioned in yesterday's post about the Free Power Source invention, we are all like twelve story buildings. The twelfth floor is where our Creators live, and the first floor is where our family relationships live. The Flower of Life level is the third floor, and on that floor reside the people who will help us get the life we want--to fulfill our group purpose in life, and to rise in power, you must make win-win agreements with everyone in the building. My Flower of Life level divides into six segments: Technology, Business and Economics, Crisis in the Family, Conflict Resolution, Tolerance and Empowerment--and World Peace is the evolutionary concept. 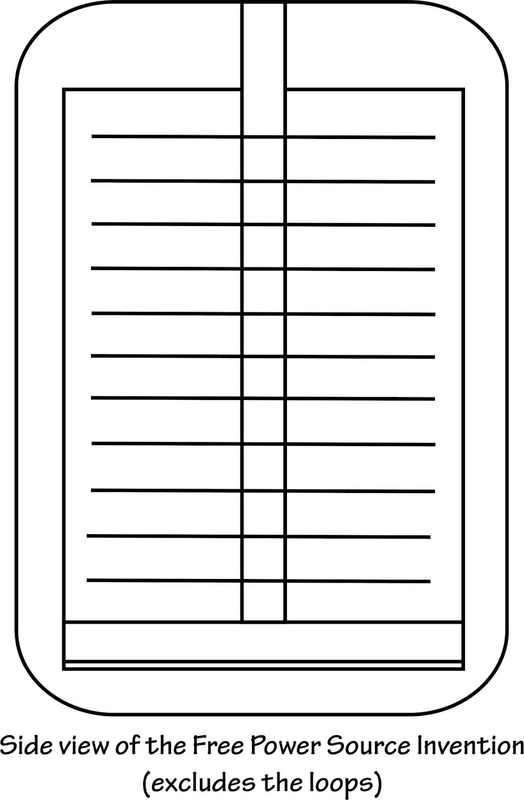 Technology includes the application of the plan, one's power base and productivity. Iran was the first to receive a project idea, but several other nations are part of the technology segment, including North and South Korea, and Yemen. There are twelve nations, and each plays a different role. In our organization, the man who is parallel to Yemen is the teacher for the experts. He can speak the language of the existing structure, but he doesn't know what to teach yet because he is part of the existing structure, and as we do our end run, he will bridge between the two and draw the existing structure forward. The Battles of Armageddon are raging in Yemen, and there is no sense of unification. Our focus is therefore on unification and conflict resolution. His role is to teach the experts about the Grand Unification Principle. The brilliant minds of mathematics, physics and cosmology have been searching for the Unified Field Theory for a long time. It is their Holy Grail. Now it is being introduced. It was there all along and they just didn't see it. The same ideas are addressed in every field, and oftentimes easier to understand an idea easier if you look at it from another field. In terms of the Grand Unification Principle, the field of spirituality has already found the all-encompassing concept and it is called God, or our Creator, or many other names. Those scientists who have made the connection to God in the Universe are ahead of those who see science as a pure concept, because they can leap back and forth between the two fields. Our technology team has been facing a roadblock. They would like to appear credible, but our innovative projects are based on channeled messages from God, and how can pure, rational scientists maintain credibility when our guides are God, angels and other kingdoms, including the animal kingdom? What if an article in the technology newsletter was written by a whale? The Animal Kingdom is part of the Universe, too, and the animals live on the eighth floor of the twelve story building. Many people consider Nature to be the battle of the fittest, that it is a dog-eat-dog world that we live in, and we must claw our way to the top of the proverbial mountain. Nature is based on the spirit of cooperation and win-win agreements, even among the different kingdoms. One of our projects is an Animal Bill of Rights. When you look at Yemen, you don't think of it as a nation that is focused on technology. There is no hi-tech industry in Yemen. It has a very low GDP, so productivity is low. That nation would like to rise in power, but like Iran, they must first address conflict resolution. Yemen was able to unite its factions in the past under President Saleh, but he was removed from office because of his oppressive power games that led to an uprising of his people. Many people were killed. Vice President al Hadi took over the country, and when President Saleh maneuvered to gain back his power through his political party, al Hadi went to the Gulf Council for help. The neighboring nations have an interest in a peaceful Yemen. President Saleh is working to make agreements with the other nations, too, to gain power. He went to Iran and asked them to share information about how to build a nuclear power industry, but attempts to get the resources and mentors failed. He then made an agreement with his former enemies, the Houthis, and fought his way back to power again, and in the process, many people were killed. The Battles of Armageddon are raging in Yemen, just as in many other nations and on every level. One side is standing on the principles and the other has gone down into the power games. The power games are oppressive to the people. For world peace to come, the people must demand their governments stop playing the oppressive power games. For peace to come, the Yemeni people must invite Yemen into the plan for the international government. No nation will mentor Yemen to build nuclear power plants, and as I said yesterday, nuclear power won't be tolerated when the understanding comes out that every atom in our Universe is in itself a Universe. The three technology inventions, starting with the Free Power Source invention, is the only power source of the future that will be in existence, and for it to provide power, the nation must let go of the power games that led to the loss of power, and them start to make win-win agreements on every level. Oil has been a predominant source of energy, but eventually the oil reserves will be depleted, and our goal is to start to transition mankind out of oil dependence by creating a free power source while simultaneously creating a new use for oil that is just as lucrative for producers but requires only a small amount of oil. It makes no sense to burn up hydrocarbons in internal combustion engines. Nuclear energy is also a major source of energy, but in the future, mankind must transition out of dependence on nuclear energy, and the reason for that is what we will cover today. Yesterday I talked about potential Nobel Prize winning projects, and in the future, if our independent members agree to work together to bring it about, we will introduce a "recipe" for a luxurious fabric that is oil-based. It will take only a very small amount of oil to produce it and so the oil-producing nations can maintain their economies while producing less oil. Right now the chemistry for the fabric is beyond our scope, and the spiritual hierarchy will not offer any more information about our projects until our independent members--who are parallel to the world leaders--are willing to work together to do what is in everyone's best interest. We are now addressing the principles of conflict resolution. Our three technological inventions come together to create a free power source. Each of the three inventions will become the solution to the crisis one nation is experiencing, so if the three nations are united with this common goal--of providing free power to the rest of the world--the world's dependence on oil will shift to creating this remarkable new fabric, not to mention be one step closer to world peace. While these nations are offered the opportunity to take leadership on the creation of these projects, because the project helps to solve the nation's problems, the projects are higher dimensional technology, and they must stand on the principles for them to work. As that nation comes to the understanding that the power games they are playing don't work, and they face the backlashes on the games, then they must figure out what will work. To bring the project about, every part of every project must stand on the principles of our organization, and all 200 nations will play a part in bringing it about, even if it involves just buying the final product. We are doing an end run on the existing structure that is deadlocked on a source of energy that is being depleted or misused or abused and must transition to a higher level. Technology, as I said in previous posts, is more than innovative gadgets. It addresses the plan stage of the planning process, and that includes the principles of power and how it is used. As the plan is introduced, it must also address the opposing principles on the planning circle, which is Crisis in the Family--it must have a rationale, solving a problem--and it must address the principles of Conflict Resolution to stop the naysayers from preventing its creation. 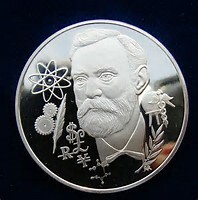 Today, we focus on the first invention, and the idea was introduced to our independent member who is parallel to Iran. It is the Free Power Source invention. Iran's intent for its nuclear power has been questioned. No one really knows whether Iran will use it as a tool or a weapon. Our invention is the middle ground because it offers free energy and solves Iran's Crisis in the Family problems, and also can only be used for peaceful purposes. Iran has not been considered equal to its surrounding nations, and this allows Iran to introduce a new form of energy that allows the region to function on a higher level. It is one of three inventions that come together, and so Iran must work together with its adversaries to bring it about. Rather than to sanction Iran, which makes the Crisis in the Family worse, and makes Iran more desperate and likely to play its power games, it is the solution that allows Iran to do what is in everyone's best interest. It is in no one's best interest for oil reserves to be depleted or for nuclear power to remain a power source in the future. Mankind looks at the Universe as being "All That Is," which is another name for our Creator. But, there is a Universe within a Universe within a Universe, and each atom is a Universe. Therefore, to split atoms is to destroy a Universe, and mankind is breaking Universal Law and facing the backlashes from doing so. This will be explained in greater depth in the future. To allow the transition away from nuclear power, we are offering the three power inventions, starting with the Free Power Source invention. Imagine you are a twelve story building, based on the human chakras, and on each floor will live a certain type of relationship, and for everyone in the building to live together in peace, you must make win-win agreements with them. Every relationship must be resolved for you to live the life you want. There are 144 relationships in all that must be resolved. On the top floor our Creators, I Am That I Am and Lady Gaia, live. They are the male and female aspects of God. We were created in their image, which is male and female, and their relationship is based on a life-partnership agreement. This win-win agreement is your soul agreement to fulfill your purpose in life, and to stand on the principles of Universal Law, and to form a life-partnership. In a liferpartnership, each has a vocation and an avocation, and one's vocation is the other's avocation, so they mentor each other to help each other create the life they want. On the lowest level live our family relationships, and this is where our power is stored. Among these relationships, as children, is where we learn power games, and so these relationships must be resolved to enable us to regain our power. To bring in your family, you first create a lifepartnership, and this is explained in our books and brochures, and our marketing projects. Where the building sits in the town is based on a continuum of frequency, like a plant that prefers a particular environment. The first building has been constructed now on an empty plane, right in the middle of a place that focuses on creativity. This building, like a plant, allows other buildings to be created. This invention is part of our technology segment, and it is a plan that enables people to have free power. If you have a Crisis in your Family, the first step is to see if you are standing on the principles of Universal Law, and then address the information in our Conflict Resolution brochures. This is a very elementary introduction to a very complex invention, but already it is allowing people to start to regain the power in their life. Eventually it will become an energy source in our lives, and we are unlimited as to what it will power. Winning the Nobel Peace Prize is probably considered the most prestigious honor in the entire world. For those who are grabbing for glory, I hate to disappoint you but the Nobel Peace Prize is obsolete, because world peace requires the active participation of every person on the planet, and while our organization has a plan that is worthy of the honor, when you consider that the sources of our innovative ideas are channeled messages, we don't even qualify because they are not our ideas in the first place. You see, the Nobel Peace Prize is obsolete. The channeled ideas have no credibility, and so we are doing what can be considered an end run on the existing structures. We will introduce ideas and then turn them over to the experts in the fields, and they will take the ideas and fit them into the existing body of knowledge, and everyone will function on a higher level as they teach the principles to the rest of the planet. What if you are offered the idea, based on the idea that you become part of the team, and you steal the idea? The application of the principles is what is important. Would you rather win the Peace Prize or see world peace come about? Stealing the idea is the perspective that the prize is more important, and that means that you won't win the prize. At Oxford and Stonehenge, our organization will introduce the Grand Unification Principle--no longer a theory. Brilliant minds, like Albert Einstein, searched for many years for a Unified Field Theory. It can be considered the Holy Grail of Mathematics, but only those who are worthy find the Grail. By fighting over the prize, you lose sight of the fact that the "unified field" cannot leave any part out of the definition. Our organization is introducing fifty innovative ideas that have the capacity to win five or more Nobel Prizes, in all the fields, and what an honor it would be to do so. The Nobel Prize raises one individual or team of collaborators to a very high level, our intent is to enable everyone on the planet to function on a very high level.Would it be an honor if you were not worthy? In an attempt to gain control of our organization, we have suffered a hostile takeover of our organization. There are people who are trying to prove they are worthy, but the only people who are worthy of being part of our organization and the framework that it is based on are those who stand on the principles of the cooperation of nature. The Nobel Prize for Economics is oftentimes given to people who come up with a theory that enables people to function on a higher level. Our economic foundation, called the cooperation of nature, is an open source idea. It was first "recognized" and developed into a mathematical science by an Italian named Fibonacci, but ancients cave drawings of spirals are symbols that they honored the cooperation of nature. The idea has been applied since the dawn of history. The idea of the egg and the sperm coming together to create a new life is the perfect example of a win-win agreement. Farmers understand that if you save a percentage of the seed from each crop, you can replant, and each year your efforts are multiplied. Basing economic practices on win-win agreements allows everyone to function on a higher level. The intellectual property thieves were offered the opportunity to function on a higher level by being part of our organization. We don't judge them because it is hard to let go of something that offers such a prestigious reward, but holding onto something turns it into a chain. Stealing the idea includes feeling that you are a fake, that it wasn't your idea in the first place, so that creates a sense of mental illness. You bounce back and forth between understanding that you can get your life on a higher level and the the fact that you are a fake. The middle ground is the solution, and that is to become part of the organization, join the team, and to let go of the idea that only you will win the prize. World peace requires everyone on the planet being part of the framework based on sharing one's talents and gifts. Under Universal Law, no one can be left out. We are all equal. Even the poorest and the youngest child is equal to the richest and the wisest and most venerable adult. While the wisest adult has a lifetime of experience, and the child still has much to teach, from their perspective, they remember Heaven. They teach those of us who have forgotten what Heaven is like because we see Hell around wherever we look. Everyone on the planet has been born with talents and gifts, and then it becomes a matter of will whether you will participate in the framework.